The picnic baskets backpack will keep you organised with all the picnic set you need in one bag catering for up to 4 people. Featuring soft padded adjustable shoulder straps for ease of comfort, especially if you are travelling quite a distance. Or if you prefer, a sturdy carry handle is featured if you prefer to carry it around. This picnic backpack for 4 person made from polyester, PEVA for the cooler compartment and 210D polyester lining this backpack will guarantee to be sturdy, secure and carry all your picnic essentials and more. 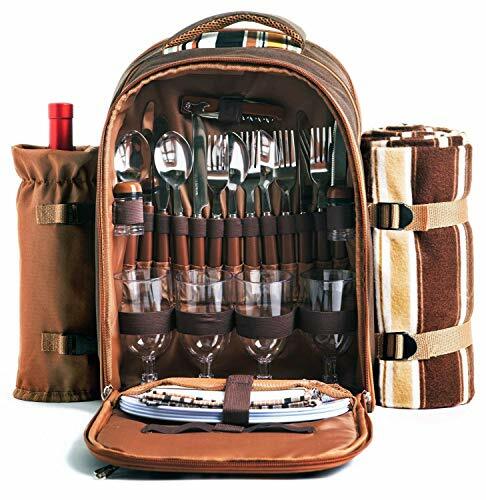 The picnic baskets backpack features a detachable bottle holder which will hold a bottle of wine and keep it cool at the same time. The blanket holder will securely holds a brown fleece tartan pattern blanket with waterproof PEVA backing to ensure you enjoy the most of your picnic even if the grass is slightly wet - size: 45" x 53". This nice picnic set can be a perfect wine gift basket to your friends also. Roomy Cooler Compartment! Store your picnic foods and keeps food at the perfect temperature for hours - an insulated wine holder is attached to the side of backpack. Great Picnic Ideas! Satisfaction Guaranteed, 50 days free exchange and returns plus 185 days warranty. If you have any questions about this product by APOLLO WALKER, contact us by completing and submitting the form below. If you are looking for a specif part number, please include it with your message.